Thanks, DEF! And loved the comment by the guy who said: "That's called "falcony" seating!! So did the "authorities". "Tom J. Cade around 1975 with one of the peregrine falcons he bred in captivity. 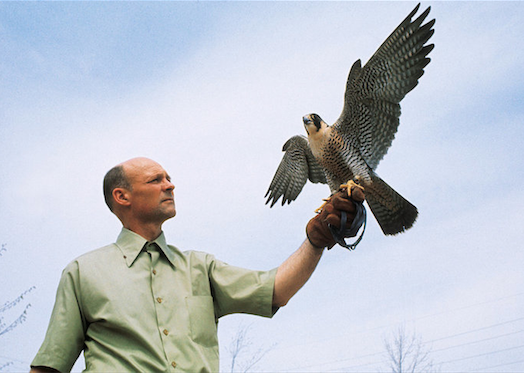 Starting in the late 1960s, Dr. Cade rallied falconers, conservationists, universities, businesses and more to reintroduce the peregrine falcon in areas where it had once thrived." At the top of one of the steam towers of Liberty Utilities' State Line Road plant, there's an open black box fronted by a perch. Three such boxes will be installed at Liberty plants before the end of the month, and officials hope they'll soon be home to peregrine falcons. The peregrine falcon eats other birds such as pigeons, which is why Liberty is particularly eager to attract them. But there's another problem being addressed here, one that could affect all aspects of our ecosystem. The peregrine falcon is currently endangered in the state of Missouri, and Liberty's nest boxes, courtesy of the Missouri Department of Conservation, are just one small piece of the puzzle to help re-establish the species in the Midwest. He was a handsome fellow. So sad.